Felix Mkandawire, a nurse at the Blantyre Malaria Project, noticed something interesting in the data that was accumulating in one of the clinical trials out in Ndirande. Researchers in Ndirande are studying HIV positive people who are receiving ART (antiretroviral therapy). The World Health Organization (WHO) recommendation is to supplement the ART with an antibiotic, cotrimoxazole. This antibiotic also has some impact on malaria, so it’s been useful in sub-Saharan Africa. The question was, once people have been on ART for awhile, and are stable, could the cotrimoxazole be discontinued without putting people at additional risk? In an early analysis, Felix noticed two things — the people who came off cotrimoxazole had more malaria illnesses than those who stayed on (but it wasn’t statistically significant; just a hint) AND they didn’t have ANY asymptomatic infections. Most adults in Ndirande can tolerate malaria infections without having any symptoms — but this group become symptomatic every time they were infected. This suggests that they lost some of their antimalarial immunity while they were on cotrimoxazole. 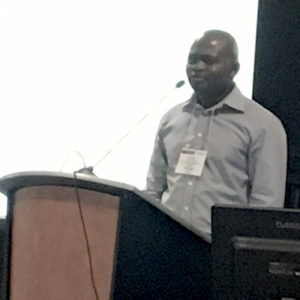 SO … in recognition of this accomplishment, the Malawi Fund and the University of Maryland shared the costs of his trip to the U.S., and he gave a terrific oral presentation in Atlanta.